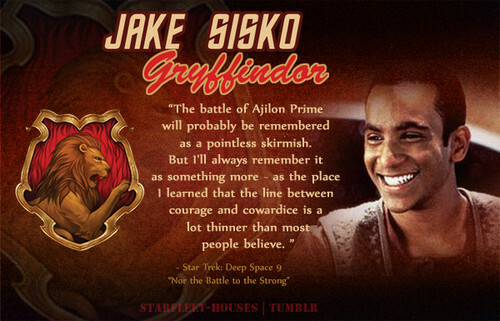 Jake Sisko - Gryffindor. He has the courage to break the mould his father had set for him and follow his dreams, enjoying sensational literature, snooping to find the best information, getting up to no good wit his friend Nog, and taking risks in order to get the best. Wallpaper and background images in the nyota Trek: Deep Space Nine club tagged: deep space nine star trek ds9 jake sisko cirroc lofton trek meets hogwarts humans. This nyota Trek: Deep Space Nine fan art might contain anime, comic kitabu, manga, cartoon, and mkono.